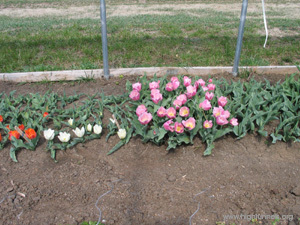 Is winter production of cut flowers feasible in unheated high tunnels? Is there a growers’ organization for those who produce cut flowers in high tunnels? What is the best stage to harvest cut flowers? What controls can I use for blister beetles that are damaging my cut flowers? Are tospoviruses a concern in specialty cut flower production? How do you plant tulips? What causes tulips to bloom short? What causes tulip flowers to be distorted upon opening? What unique market niches do trays and pans of bulbs offer? Based on research in Oklahoma, unheated winter production of crops like delphinium and lupine is not recommended in areas with minimum winter temperatures of 29°F (-2°C) or lower due to the likelihood of frost damage. However, frost-tolerant species including larkspur, snapdragon, and stock can withstand at least one night of 22°F (-6°C) with no negative effects. Yes; the Association of Specialty Cut Flower Growers (ASCFG) provides numerous benefits and resources for producers of cut flowers. This organization is well-known for its generous membership which willingly shares information. It produces a trade publication, The Cut Flower Quarterly, and a buyers’ guide. In addition, regional meetings and an annual national conference provide information, networking opportunities, and business contacts. The optimal stage to harvest cut flowers varies by species…and there are so many species! The ideal harvest stage, based on maximizing the life of the flower after cutting it, is usually before a flower “peaks” or before all of the flowers of an inflorescence are open, but there are exceptions to this rule. For example, dahlias should be cut just as the flower is fully open. Fortunately, several extensive lists of flowers’ optimum developmental stage at harvest have been compiled, and two are linked here. Blister beetles can cause severe damage to horticulture crops. Their distinctive elongated ‘neck-like’ section make them easy to identify. The blister beetles lay eggs in the soil and larvae feed on grasshopper eggs and larvae of soil-dwelling solitary bees. 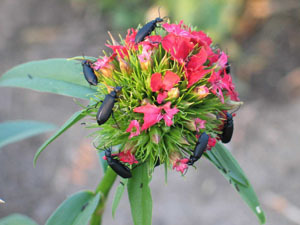 Adults of some blister beetle species feed on flowers and pollen while others favor foliage. The black blister beetle, Epicauta pensylvania (see photo) is a common pest of cut flower crops like dianthus, sunflower, amaranthus, and aster. Because the beetles are very mobile, control requires repeated application of Sevin (carbaryl) or malathion. to prevent further spread of the virus. 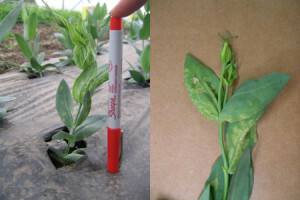 The presence of tospovirus in the lisianthus plants showing the tan lesions was confirmed via the easy-to-use ImmunoStrip® Test Kits. Interestingly, nearby plants that did not develop the symptomology were shown to be uninfected via testing. We surmised that the virus was transmitted to several lisianthus seedlings that had been a fed on by infected thrips during plug production in a greenhouse, while neighboring seedlings that were passed over by the thrips in the same plug tray remained healthy. Most tulip bulbs for high tunnels are considered annual crops and are planted at a tighter spacing than is commonly done in home landscapes. The soil that will be beneath the bulbs should be worked well to ensure good drainage; this reduces the incidence of bulb rot and helps ensure uniform emergence in the spring. Planting into raised beds is another way to provide good drainage. Tulip bulbs should not touch but can be spaced very closely (e.g. 36 bulbs in an 18” x 36” area). The tunic, or the brown “skin” on the bulb, should be left in place as it has some anti-microbial properties; it can be removed in the spring as the shoot emerges if it is girdling the stem. 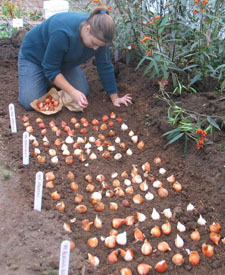 After initial preparation of the planting bed, it took one person 15 to 20 minutes to plant and cover 216 tulip bulbs (see photo). When the entire area is planted, soil is pulled over the bulbs and the beds are watered. Often a fungicide (e.g. Banrot) is applied to the bulbs as either a dip prior to planting, incorporated as a granule, or applied as a soil drench after planting. Some examples of biological inhibitors of root rot pathogens that offer alternatives to fungicides include Trichoderma harzianum (PlantShield), Bacillus subtilis strain GB03 (Concept, Companion, Kodiak), and Streptomyces griseoviridus strain K61 (Mycostop). Length of tulip stems at harvest is related to two aspects of temperature: number of cold weeks before flowering and temperature during the last stage before flowering, when flower buds are visible. 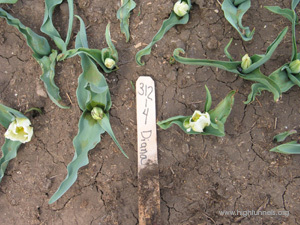 When tulip bulbs are planted in the fall, they should already have completely differentiated flower parts. So in the case of tulips, the dormancy-breaking cold weeks are not necessary to induce the flower to form; it is already present in the bulb. However, a requisite amount of time at cold temperatures (which varies by cultivar) is required for flower stem elongation. During these cold weeks, a growth hormone called gibberellic acid (GA) is translocated to the growing point of the bulb, and this contributes to the development of the long stems that we desire in cut tulips. If cold weeks are short, the naturally-produced GA is not present in sufficient quantities to lengthen stems before the flower opens. The second aspect of temperature that can dramatically influence the length of cut tulip stems is how warm it is when the flower stems are elongating; warmer temperatures contribute to longer and weaker stems; colder temperatures result in shorter, sturdier stems. It is usually difficult to get to bottom of what causes tulip flowers to “blast.” Blasting is defined as the failure of a bulb to develop a marketable flower after the flower parts have been initiated. High temperatures during bulb shipment or storage prior to planting. Ethylene exposure, which can be a problem is some bulbs are infected with disease during shipment or storage. Allowing the root medium to dry excessively, especially in combination with high temperatures. A lack of adequate ventilation during shipment or storage of bulbs. Poor root system development which might be caused by improper watering, very high soluble salts, or even very tight tunics. Bulbs produced in pans or trays offer florists a convenient, attractive, and fragrant display. 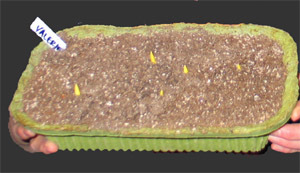 Production in trays or pans allows for multiple uses of the same plants. For example, the entire flat could be rented for one event, then individual stems could sold in cut arrangements for another. Trays of nearly-ready-to-harvest flowering bulbs store well in a cooler until they are needed. In addition, some growers arrange to re-use the flat at no cost to the florist. This narrated presentation linked at right outlines culture, budget and marketability information for Muscari armeniacum stems produced in trays.